No, not my OWN wedding – my first wedding where I was playing the role of cake baker! I think this was the perfect first wedding cake for me. First, it was only partially a cake – the rest of it was cupcakes. And second, it was for a very small crowd of only 30 people and that suited me very well. Andrea is a friend from The Nest, and coincidentally also someone who I have known since elementary school. She asked me to do this cupcake tower for her cousin’s wedding. I started making some of the components for this cake a week in advance since I knew I had to deliver it mid-week. I mixed up 1.5 batches of Wilton’s lemon buttercream icing and dyed it light blue (I left out the lemon zest because I wasn’t sure how that would turn out after being dyed). Then I did 2 batches of Wilton’s vanilla buttercream and dyed that light blue also. I put the icing in plastic containers and put them in the fridge until I would need them several days later. Refrigerating the icing had no adverse affects. When I was ready to use it, I took it out of the fridge and gave it a quick mix with a hand mixer. For the fondant decorations, I tinted some fondant red and some blue. I used cookie cutters to cut out the hearts I needed to top the cupcakes and a few larger hearts that I was thinking of using for the topper. I would wait to cut out the hearts for the side of the cake until the last minute because I wanted them to be very flexible (ie, not dried at all). For the rest of the decorations though, it was actually preferable to let them dry for a bit, so they were fine to make up early. I also made 5 red roses out of fondant. You can read about how I did that here. Two days before the wedding, I made up 2 batches of Wilton’s golden yellow cake (my favorite yellow cake). This was enough cake batter to make 2 6″ round cake layers and 36 cupcakes. I used red liners that I found at Michaels. The day before the wedding, I got out everything I had made so far and started decorating. 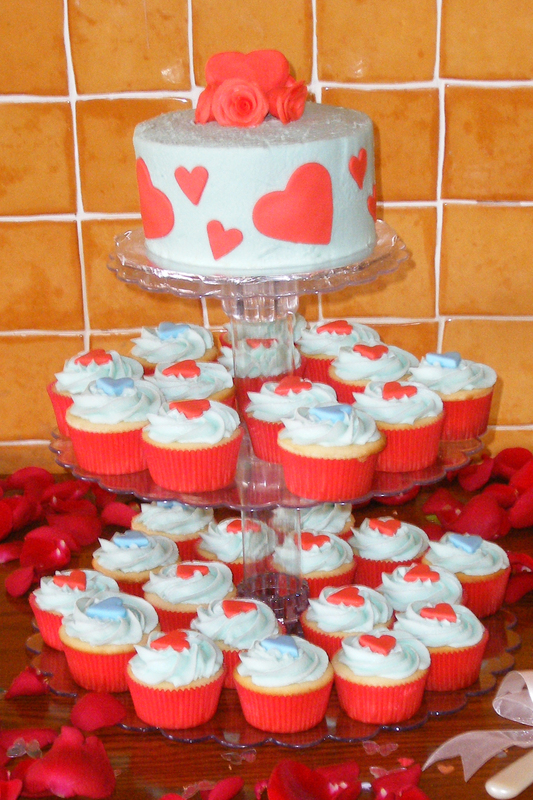 The cupcakes got a simple swirl of icing with a 1M tip, and topped with a fondant heart. For the cake, I did a filling, then a crumb coat, and then a final coat of icing with vanilla buttercream. After I waited for the icing on the cake to crust a bit, I rolled out my red fondant very thin and cut out hearts in two sizes. I attached them to the sides of the cake with a tiny smear of buttercream. For the topper, I used my five fondant roses arranged in a circle on top (secured with tooth picks) and I added a larger red fondant heart in the middle. The heart was held up by a lollipop stick. I wasn’t 100% happy with this topper – especially since it only just barely fit underneath the cake dome I was using! But I didn’t have any other ideas, so I just went with it. For the cupcake tower, I used 3 different diameter plates and two 4″ pieces of tubing to create a stand that was the perfect size. I actually had to cut one of the existing pieces of tubing in half to accomplish this, but it turned out so well. This stand is actually from my own wedding, just a little rearranged. This entry was posted on Saturday, July 17th, 2010 at 12:00 am and is filed under American buttercream, Wilton fondant, Yellow cake. You can follow any responses to this entry through the RSS 2.0 feed. You can leave a response, or trackback from your own site.